When Sandra Seiden saw what being around miniature ponies did for her special needs son, she knew she had to share the ponies with other children who faced the same challenges. 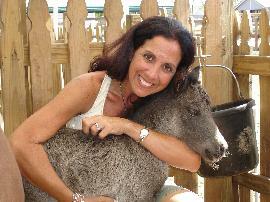 Sandra was asked by founder Marianne Alexander to be the Florida Director about three months after her son received his ponies from the program. Seeing these changes inspired Sandra to share with others. "Very often, a child with special needs doesn't have a best friend. The ponies do not judge or laugh; they seem to understand and a trusting friendship develops. Personal Ponies promotes an "I CAN" attitude by allowing the child to interact through tasks such as grooming, handling, stall maintenance and feeding the pony. It is our goal this "I CAN" attitude will carry over to school, family and social settings." Sandra is a wife, full-time mother, tennis player and avid equestrian who rides her horse "Dreama" as much as she can. "This program started as Marianne Alexander's dream but has become my passion, it's a volunteer position that has become a full-time job. A true labor of love, but it's one of the most rewarding things I have ever done." Please feel free to explore our Web site to find out more about us, and the programs we offer. For more information on the National program visit www.personalponies.org.